Not every church repainting job turns out as badly as the "Ecce Homo" fresco in Spain. In fact, these churches all became far more fascinating after people added sometimes bizarre, sometimes beautiful paintings to them. The Voroneț Monastery, Southern Bukovina, Romania, constructed by Stephen the Great in 1488 to commemorate a battle victory. The exterior walls were painted in 1547 by the Metropolitan Bishop of Moldavia named Grigorie Roșca. It was abandoned in the late 1770s, never used in the next more than two hundred years, but now it's still unrestored. Humor Monastery, Romania, built in 1530, abandoned in 1786 for two decades. 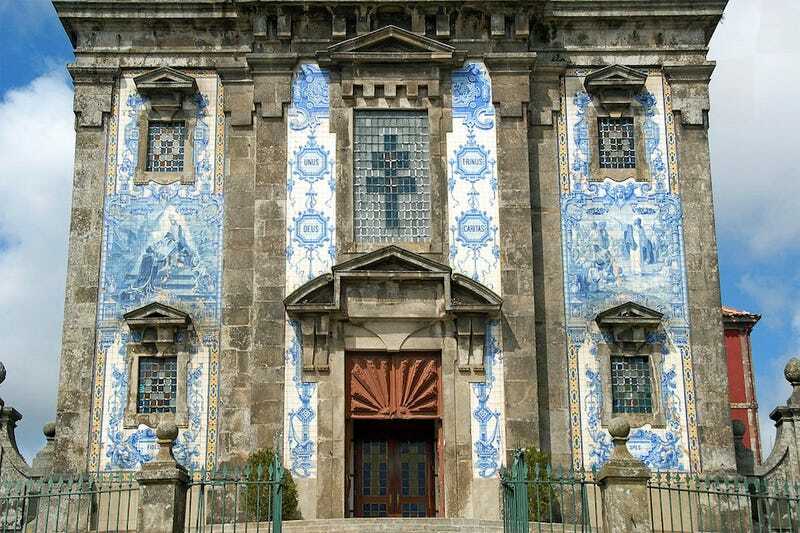 Capela das Almas (The Chapel of Souls), also known as the Chapel of St. Catarina, Porto, Portugal, covered with 15,947 blue and white ceramic tiles in 1929 made by Eduardo Leite. The Church of San Francisco in Puebla, Mexico, dedicated as the Five Wounds of Our Seraphic Father St. Francis of Assisi. Its main facade was built in the 18th century. The Igreja de Santo Ildefonso (Church of Saint Ildefonso), Porto, Portugal, completed in 1739. 11,000 azulejo tiles were added to the façade by Jorge Colaço in 1932. These tiles depict scenes from the life of Saint Ildefonso and imagery from the Gospels. The Shrine Basilica of Our Lady of Dolours in Trichur, India, built in 1929, decorated in colorful lights on 25 November every year. These photos are from 2007 (above) and 2011 (below).